Posted by cafuego on Sunday 5 February 2017. When I first got the Mac, I had a lot of trouble getting Wine to run reliably and eventually ended up doing my alignment and processing manually in The Gimp. However, that's time consuming and rather fiddly and limited to stacking static exposures. I thought I'd document what I use, in the hope that I can save others who want to use their Macs some searching. Some are Windows software, but run OK on Mac OS X. You can turn them into normal double click applications using a utility called WineSkin Winery. A few weeks ago I bought a ZWO ASI120MC-S astro camera, as that was on sale and listed by Nebulosity as supported by OSX. Until then I'd messed around with a hacked up Logitech webcam, which seemed to only be supported by the Photo Booth app. I've not done any guiding yet (I need a way to mount the guide scope on the main scope - d'oh) but the camera works well with Nebulosity 4 and oaCapture. I'm looking forward to being able to grab Jupiter with it in a month or so and Saturn and Mars later this year. 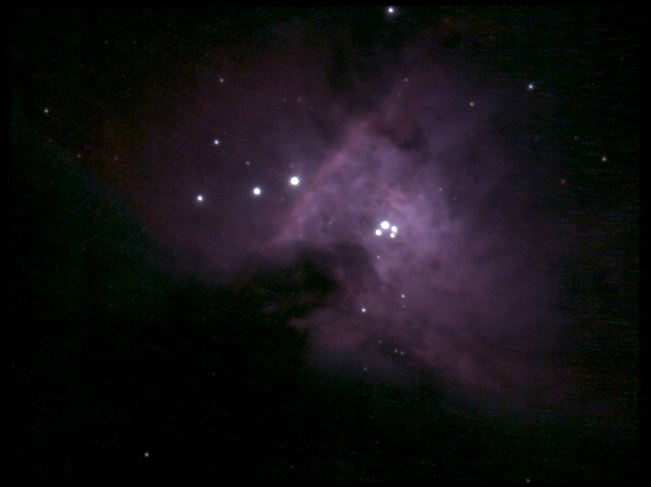 The image to the right is a stack of 24x5 second unguided exposures of the trapezium in M42. Not too bad for a quick test on a half-moon night. I've been fiddling with Nebulosity abit, to try and get it to stack the RAW images from my Nikon D750 as colour. I found a conversion matrix that was supposed to be decent, but as it turns out that made all images far too blue. The current matrix I use is listed below. If you find a better one, please let me know. Wish Nebulosity was easier to use! The Matrix in Nebulosity is far too complex, I wish it were far more simple. I've spent countless hours trying to find a matrix that works for my Pentax, but it doesn't even come close. If you can afford it, try PixInsight. In comparison it's like Photoshop (PisInsight) vs MS-Paint (Nebulosity) and yet, it's RAW conversion is 1000x more simple. Free full trial for 30 days.